It´s done, the Tameshigiri book is out now! As stated in the preface of several of my other publications, I am always trying to fill gaps and some of the blank spots in the area of non-Japanese sword-related publications. The legendary sharpness of Japanese swords is widely known, and through the activities of various martial arts practitioner’s information on tameshigiri has also become more accessible in the recent years. But, for a large part, this information focusses on modern cutting tests and only briefly discusses the historical aspect. 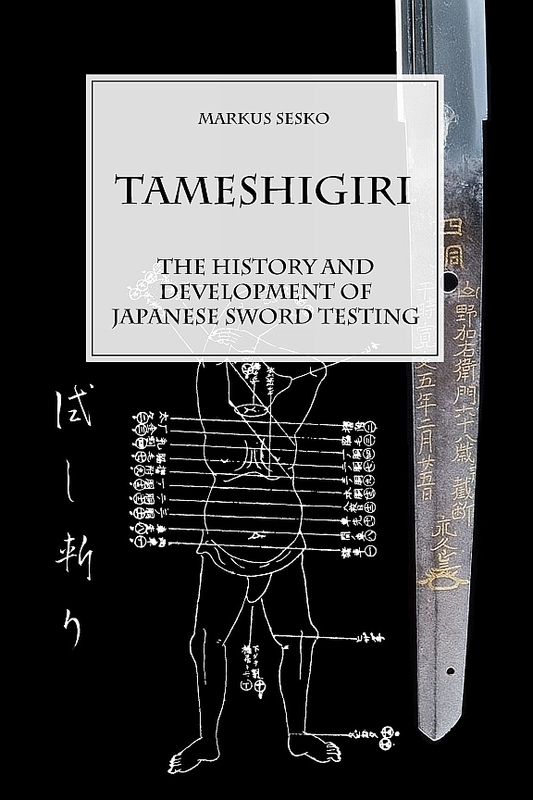 As far as sword collectors and enthusiasts are concerned, the subject of tameshigiri has been approached by several experts in the past, but here too information is rather limited. Because this status-quo of information, being only available on certain aspects of sword or cutting tests, had prevailed virtually unchanged for decades, several misunderstandings of tameshigiri had become firmly anchored in the minds of both martial artists and collectors. This publication systematically processes this subject for the first time to provide an, as complete as possible, overview of the historical aspect of tameshigiri. Not only are the developments from mere sword tests to systematic cutting tests under repeatable conditions are addressed, it also explains the sword testers, the various cuts and set-ups for cuts, and the practice of recording cutting test results on sword tangs for example. It is rounded-off by a reference section which provides examples of tameshi-mei from more than forty different sword testers. To conclude, I would like to express my sincere thanks to all those who have provided me with a wealth of reference material. This was an incredible experience because I received support from all parts of the world which confirmed my belief that this book was long overdue. Without your support this project would probably have remained on my to-do list as I did not want to publish an incomplete book on this subject which again would have left more questions than answers. In this sense I hope that Tameshigiri – The History and Development of Japanese Sword Testing meets the high expectations of such a publication and serves this and future generations of nihontō enthusiasts and martial artists likewise as a valuable reference. Hardcover copy. 6″ x 9″, 378 pages (b/w) for 69.90 USD is available here. And the eBook for 29.90 here. You will have noticed that the pre-order option was for a slightly lower price. That was because I first estimated to just scratch the 300 pages mark but after incorporating more reference material and adding several chapters, the publication arrived at 378 pages. But please, none of the pre-orderers have to pay the extra 10 USD. See this as little discount for supporting the project with your pre-order. I will ship the signed books as soon as my author´s copies arrive here and I will post a little note here when done. Please note that I know from experience that Lulu´s shipment to Austria is rather slow so this might take a while. PS: I would be most grateful if the book is ordered directly via Lulu.com because Amazon (where it should appear in a few days) deducts almost 3/4ths of the royalties per sold copy! Thank you very much.